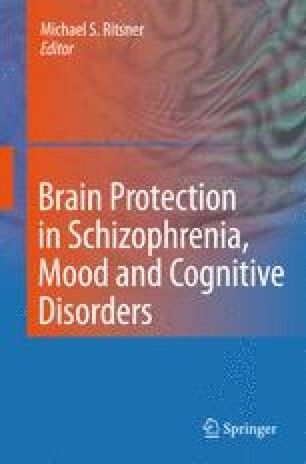 Although current antipsychotic medications are able to reduce psychotic symptoms by blocking dopamine 2 (D2) receptors, they are limited in their ability to treat certain aspects of schizophrenia, such as flat affect, social withdrawal, and cognitive impairments, all which influence an individual’s ability to function in society. For over fifteen years, increasing emphasis has been placed on hypofunction at the N-methyl-D-aspartate receptor (NMDAR) as a potential mechanism underlying the pathophysiology of schizophrenia. Altering NMDAR-mediated neurotransmission by targeting components of the glutamatergic synapse offers a new paradigm by which to generate new drugs to treat schizophrenia. The potential for improving cognitive symptoms, with the ultimate goal of improving functional outcome, is especially alluring given NMDAR’s critical role in learning and memory. Several clinical trials have been conducted with agents that enhance NMDAR function by increasing activity at the glycine co-agonist site (GCS). The GCS can be directly activated by amino acids, such as glycine or D-serine, or indirectly, by blocking glycine transporter-1 (GlyT-1) reuptake of glycine from the synaptic cleft. While there have been limited clinical trials of GlyT-1 inhibitors in humans, translational research in animal models has demonstrated the antipsychotic effects and cognitive enhancement of these agents. Thus, the 21st century holds promise as the era in which an entirely new type of medication for schizophrenia may be created, one with more success at treating the debilitating negative and cognitive symptoms of this disease. GET is supported in part by Los Angeles Biomedical Research Institute and National Alliance of Research on Schizophrenia and Affective Disorder.